Graham has been our Musical Director since 2009. He began his musical studies on the piano aged five and then began learning the organ aged 11 and the trombone aged 14. On completing his A levels in 2002, Graham studied music at Colchester Institute and graduated with a 2:1 in July 2005. From 2006 – 2011 Graham was a Peripatetic Music Teacher for Southampton Music Service, teaching Piano and Keyboard in many different schools across Southampton. Graham now works at Richard Taunton Sixth Form College, Southampton where he teaches piano. In addition to this, Graham is the musical director of Winchester City Festival Choir and Sarisbury Choral Society and also works as a freelance musician, teaching music privately and playing the organ for services at various churches in the area. 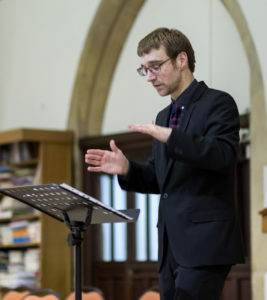 In September 2015, he became the Director of Music at St. James’ West End and in January 2016 was appointed rehearsal accompanist to Southampton Choral Society. Graham is on the music staff for the Hamble Area Youth Band as a conductor and percussion ‘expert’! In his spare time, Graham can be found at a spa or a steam rally.